This is not the story of how the insatiable FDR cheated on his wife, leaving the pair in a marriage maintained only for the sake of appearances and finances. It’s a lot more complicated and — in Rowley’s view — a lot more important than that. It is well established by now that in 1918 Eleanor discovered love letters written by her secretary, Lucy Mercer, to FDR, and that the incident had a permanent impact on the marriage. It is also known that FDR promised never to see Lucy Mercer again and that he broke that promise — in fact, that Lucy was among those who were with him in Warm Springs, Ga., in 1945, when he suffered the cerebral stroke that resulted in his death. 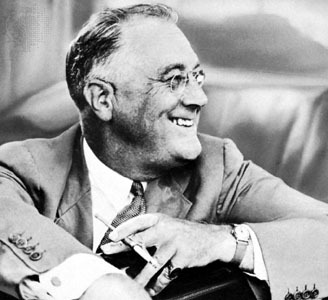 It is also known that Franklin Roosevelt was an incurable flirt, and that he highly valued his relationships with women who were both charming in their own right and — this was essential — who were charmed by him. Rowley explains that this tendency often irritated Eleanor, but that she came to understand and accept the importance of certain women in her husband’s life. But the author explains that there was much more to the story than that. 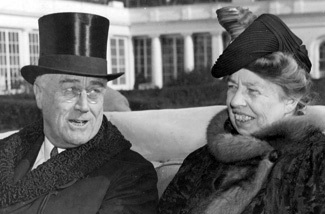 Physical intimacy disappeared from the Roosevelts’ marriage, but Rowley writes that Eleanor, who had six children in relatively rapid succession, thought of her sexual relations as a necessary but unwelcome burden. But Eleanor, like most human beings, had needs of her own with respect to affection and intimacy. She fulfilled these needs in more than one way, with both women and men, though how intimate these relationships were is largely a matter of conjecture. Rowley recounts that Franklin encouraged his wife’s friendship with a lesbian couple to the point of helping the three of them build a house and a workshop on property he owned near his mother’s home in Hyde Park, N.Y.
Whatever relationships Franklin and Eleanor forged outside their marriage, Rowley maintains, the two of them continued to love and support each other, and they formed a partnership whose vigor helped carry the nation through the Great Depression and the Second World War. At times they seemed to constitute a single person, as Eleanor traveled to places at home and abroad that were beyond her paralyzed husband’s capacity. Although Eleanor’s activism occasionally embarrassed the politically sensitive Franklin, they shared many of the same ideals of social justice. In the process of describing the marriage of these two gigantic historical figures, Rowley draws portraits of many of the interesting characters in the Roosevelt clan and entourage — a crowd that FDR liked to think of as a big, happy family. 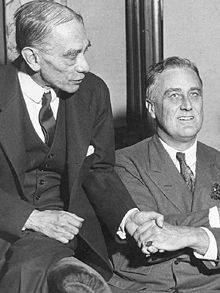 Not the least of the players was Louis Howe, a disheveled ex-journalist who was one of FDR’s closest advisers for most of his political career, the tireless battery behind the campaigns that made Roosevelt governor of New York and president of the United States. Some of the people around Roosevelt — including his patrician mother, Sara — disapproved of this little man with cigarette ashes on his rumpled clothing, but Eleanor wasn’t one of them, and Rowley describes how it was Howe who repeatedly encouraged Eleanor to make herself heard on the issues that were important to her — a visionary attitude in that male-dominated era.